The league is finally over, thank goodness! We finished 6th. It has been a whirlwind of a season. From almost being relegated to almost topping the relegation table to 6th! YAY! Brilliant coach who puts the F in fear. New girls in the team. 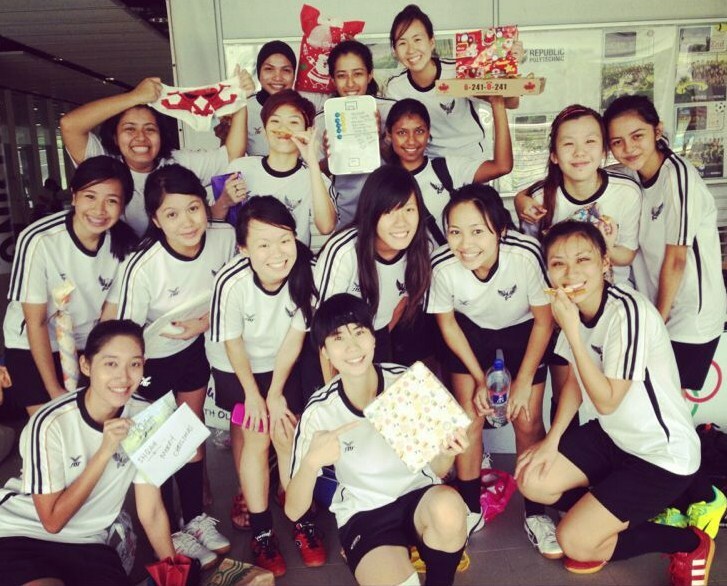 Noobs who learnt from scratch and are now so passionate about floorball. So happy that our team sticks together and they are happy to play together. We believe in building a team for the future and we will work towards that in 2013. Roll on 2013! Keep the training enquiries coming in. We will reply to you regarding our first training session. Author funfloorballPosted on December 31, 2012 December 31, 2012 Categories Season 2012: Division 2Leave a comment on What A Year! We secured all three points last weekend in a tough game. The gold ribbons we wore were to support one of our dear team mates who is facing a difficult time and could not be with us yesterday. We did not have a good run of games recently. Losses against Young Flamingos, favourites for the title and SMU Foxes, whose resilience we could not break down. They were very strong opponents and there is definitely much to be learnt from them. Our treasurer gave everyone something. After two matches ending with no points, we finally secured all three in our third match this afternoon. There was a flurry of goals in the third period but we managed to hang on. Very happy with our performance and hope we can do the same for our final four games this month. Please feel free to email us if you want to swop with our slots. We will see if we can. For teams that would like to reschedule their matches, you may do so by swopping your slot with another slot with the permission and acknowledgement by the other 2 teams from that slot and your opponents. Upon the agreement of the 3 teams, please informed me as soon as possible so that I can make the necessary adjustment to the fixtures and to inform the referee schedulerer. Ladies match can only be swopped with another ladies match and likewise for the men’s side. Alternatively you may choose you play your matches which you would like to reschedule at an alternative venue however please note that SFA would not be reimbursing you the court fees as the SFA have already paid the scheduled slot court fees to Republic Polytechnic. If you are to play at an alternative venue, the court must be of the standard floorball rink size and the necessary line markings are to be present. Please also inform me at least 2 weeks in advance so that I could arrange for referees for the match. Lastly for teams that have not made payments for the league fees, please kindly do so by 23th Nov 2012. Thanks. We are thrilled to be in the promotion table this year after two gruelling seasons in the floorball league. Because of the increasing number of women’s teams competing in SFL, this promo/relegation playoff tables were introduced. Our aim this year was to reach the promotion table and we achieved it together as a team! Anything further will be a bonus. I am very proud of the core team – Hui An / Dira / Aza / Francine / Izy / Syahirah / Jovina / Shing / Shyqah. We fought together over the two years to reach here together, not giving up on the team when we were almost relegated in 2010 and missed the promotion table by a few points in 2011. I am equally proud of the league newbies (Cara / Anna / Zy / Faz / Fiona / Aimee / Tina / Diana / Priscilla) who joined us with so much enthusiasm to learn- either introduced by friends and via our website. Our coach trained them from scratch to compete in the league. Their unwavering committment and effort in training paid off. This is how floorball becomes more than just a sport. It is not about a winning scoreline; it is about how we achieve it together as a team. Playing with goodlooking *muahaha* team mates who contribute to everything positive about being in a team both in and out of court is a priceless experience that I am thankful for. I have played floorball long enough to know that this is something very special and unique to our team that we will strive to upkeep. Well done girls! Keep up the good spirit! p.s To those who wrote in regarding our training dates, just email me. I will provide you with more info, thanks! Author funfloorballPosted on November 8, 2012 November 14, 2012 Categories Season 2012: Division 21 Comment on Promo Battle!